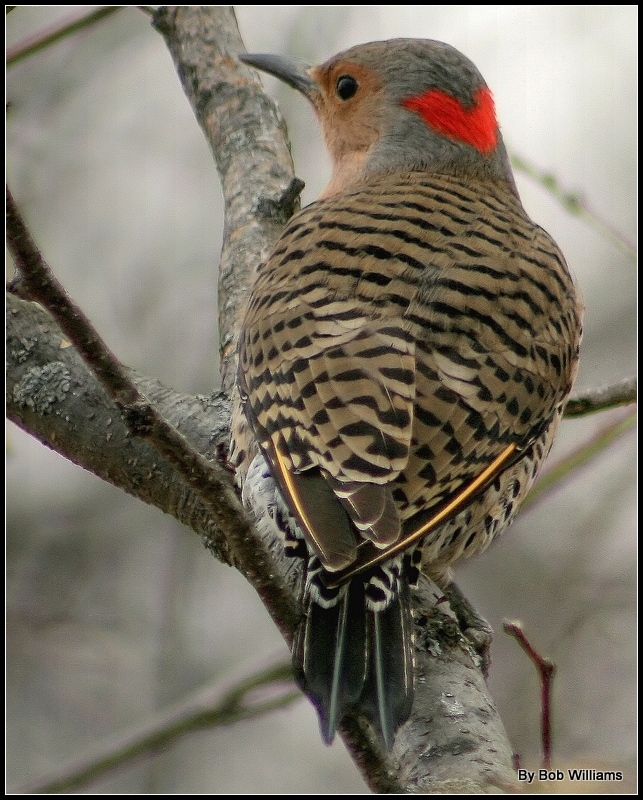 A few days ago I had posted a picture of a Northern Flicker at one of my feeders. This is the same flicker resting in the tree. I am posting this just to show the back of the the bird and the red spot on it's head. AS I said before, to me this is one of the most beautiful birds we have in our area. This will be my last post of the Flicker for a while. I hope to move on to something else tomorrow. Hi Bob.It pays to see the back some time so we can see the feather markings. You have taken this one with good detail and bright natural colours. We can alos see the red V mark on the neck. well done TFS. Very nice capture of this beautiful bird. Excellent sharpness. Great detail of the plumage. Wonderful colours. Excellent close and sharp photo of this flicker. Great details. Beautiful natural colours and OOF BG. Thanks for giving us a different view of this beautiful bird. The red spot on the back of it's head actually looks like a V.
I've never noticed that before! !